As chefs, we often become comfortable in our styles. We know how to push the limits within said style, however, we may not always be willing to step out on a ledge and try something drastically different. I would define my style as simple and respectful. I appreciate the beauty of a raw apple or the aroma of rubbed tarragon picked right from the garden. I buy or grow the finest ingredients I could get my hands on because I love and respect what I serve. Although I am classically Italian trained, my cooking beliefs have transformed over the years into something completely different. Into something that I consider to be true and honest. So why am I saying this? Why am I talking about how I cook and what my culinary norm is? Because I had the pleasure of being challenged a short while ago to execute a dinner of extreme elegance. I was asked to give a Michelin dining experience to small group. The wheels started turning immediately and I began to work on a menu. I am a very classic cook when it comes to technique. Along with my purist mentality on ingredients, I also cherish and prefer simple cooking methods. A good sear on a protein, hardwood grilling, braising, open fire slow roasting, these are some of my favorite techniques. While they are beautiful- they were not enough to pull off this type of dinner. Now, I knew how to execute every item on the menu deliciously, but it wasn’t the best it could be. I began to dissect each dish, piece by piece, bite by bite. I wanted to take both myself and my diners on a culinary adventure to somewhere neither of us have been, but to do that, I had to learn a few new tricks. I dug through my library of cookbooks and endless amounts of cooking sites and I began to pull inspiration from them. 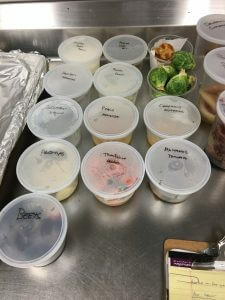 I looked at different ways to make purees, compose sauces and cook vegetables. I discovered a great deal of things that I never thought of before. It was so simple and I felt like I was 20 again learning about classic French cooking techniques for the first time. 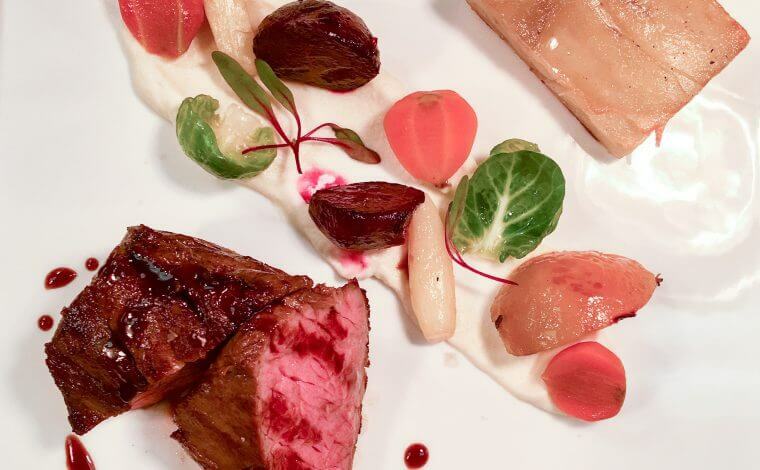 The biggest thing for me was working with sous vide cooking for more than just proteins. I was already cooking several items sous vide… mostly pork bellies, briskets, short ribs, other tough cuts of meat that I want to cook at a controlled temperature and maximize yields. But the more I started to dive into the possibilities, the more I was excited to take on this new style of cooking. So, what was the menu I ended up serving? 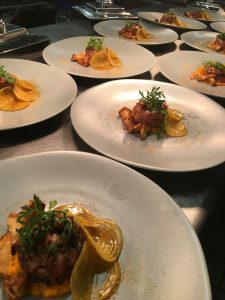 As the dinner was in early September, I wanted to create a menu that brought my diners from the end of summer into early autumn. 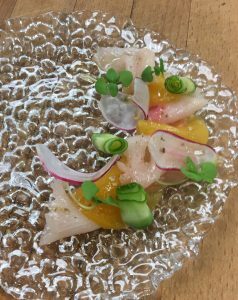 I focused on bringing a different experience in both flavor and texture to each course so the meal would stay exciting. I started in my garden, as produce is the greatest expression of the seasons, tasting and picking vegetables to see what I wanted to use. Once I had that guideline, I chose my proteins. This may not be the traditional way most chefs write their menus, as many look at the protein and build the flavors around it. Peaches and nectarines were in their prime- two of my favorite fruits. I immediately built the amuse and first course with those. Then, I stated to look at mushrooms. A farmer I know told me he had some beautiful chanterelles; course two identified. After that, I chose sunchokes, sunflower seeds and black garlic for the third course. A great follow up to the mushrooms and a good preface for the fourth course. I felt at this point the diners would be ready to start tasting fall, so I brought in the root vegetables. This was a great progression from where the dinner started. Finally, I created the last course with pears. Nothing says fall to me like pears, and I had some beauties growing that were ready to pick. So now that I had my flavor profiles, it was time to build my menu! Amuse –Rich, sweet and zesty. A good start to ignite the palate for courses to come. First Course– Chilled, refreshing and lightly spicy. Brighten the mouth for a rich following course. Second Course– Earthy, gelatinous, and full bodied. Overload the palate with richness as the mid-course. Third Course– Smokey, sweet and acidic. A bright recovery from the pork and a bridge to the steak. Fourth Course– Tangy, earthy and creamy. A full balanced entrée with the textures and experiences to complete the savory part of the meal. Fifth Course– Rich, salty and lightly spiced. A subtle ending to a variety of experiences. The meal was a success! My team and I dug deep into our culinary repertoire and took every step to give pure elegance. We peeled the tomatoes, strained the sauces through coffee filters, hand-picked every leaf, and did every other obsessive step to give the best we could. This really was a fantastic experience for me as it reminded me of how much more beauty there is in the culinary world. As I always say, if you put your whole heart into cooking and take your time, you can truly create something beautiful and memorable. One of my absolute favorite things to make is Giardiniera. I am constantly pickling, or preserving food in vinegar, all year long. It is my way of hanging on to the best food throughout the seasons and having them available for a longer period of time. In spring I pickle carrots, in summer, sweet bell peppers and a variety of mushrooms and other produce throughout the rest of the year. Every culture has a version of pickling. Korean cuisine has kim chi, Mexican has escabeche and German—senfgurken. It all started from the need to extend the consumable life of food. What was once a necessity to survive has now become a culinary treasure. The flavors and textures of pickled foods both accent and elevate today’s culinary art. But in Chicago, we have one thing that stands above the rest. One delicious component that when added to grilled sausage sandwiches, Italian beef, and even pizza brings out the hometown flavor that makes Chicago so unique. I’m talking about Hot Giardiniera. Giardiniera is a mouth-watering combination of chilies, vegetables, vinegar and oil. It can be made mild or spicy and is extremely versatile. This is something I have been eating my entire life and would be hard pressed if I didn’t have it in my pantry. There are a lot of great options in the market to buy, but I can never buy one that gives me the flavors, textures and satisfaction I get when I make it myself. I now make gallons of hot giardiniera every few months. 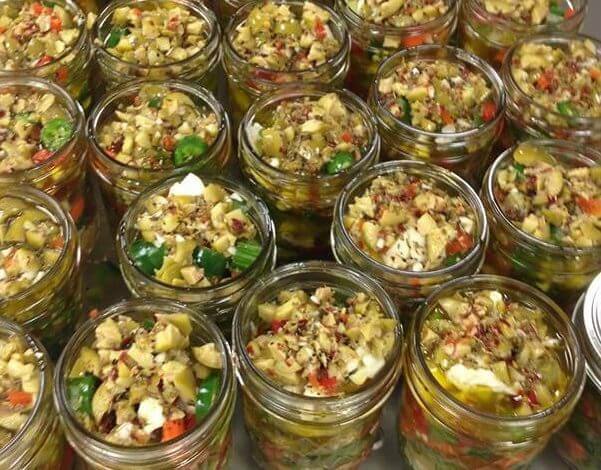 My giardiniera is a two day process to prepare and is all about fresh, quality ingredients. The standard vegetable blend is jalapenos, carrots, celery, and cauliflower, which I love. Over the years I have altered my blend to add a few more layers of flavor that make it unique and even more delicious. First things first, let’s start with the vegetables. I cut all of the vegetables into an even sized ¼ inch dice and mix well. After I have my vegetable mix, I season them. I do this by adding ¼ cup of kosher salt and enough cold water to just cover the vegetables. I stir to mix them well and then place them into the refrigerator overnight. The next day, after the vegetables have absorbed the salt, I drain and rinse them in cold water. This is a very important step to assure that the vegetables are well seasoned, but not too salty. Now it is time to make the brine which will pickle the vegetables and develop the true giardiniera flavor. I finely chop the garlic and olive and put them in a stainless steel bowl. I add the spices, vinegar and oil and whisk to make sure it is well mixed. Then, I put the vegetables in a glass container. I pour the vinegar and spice mixture over the top vegetables and stir well to make sure it is evenly mixed. The liquid should barely cover the vegetables. Now there are two options to let my giardiniera blossom. The easiest method is to place the glass container with a lid into the refrigerator. In 4-5 days, it is ready to eat. The other way is to preserve the giardiniera by canning it. But that is a conversation for another day. For now, give this a try and enjoy your taste of Chicago! Christmas Eve Dinner. My favorite meal of the year. Like any good Catholic Italian-American family, we celebrated The Feast of the Seven Fishes. Every year, my family would gather in my Uncle’s basement for a giant seafood dinner. My Nana would make her homemade fettucine with Baccalà Sauce– we would feast on fish salad, mussels, shrimp and so on. The kids who didn’t eat fish would enjoy homemade focaccia and buttered noodles. We ate all night. We drank all night. While there was no shortage of wine, meat was something we NEVER had on Christmas Eve. The Feast of the Seven Fishes is a longtime Italian Christmas Eve tradition. It started with the Roman Catholic belief of abstaining from meat from Christmas Eve until the grand feast on Christmas day. The symbolism that goes into this meal is something worth knowing. Not all people do seven. Some do eight, twelve, or in my family’s case, thirteen! But where do these numbers come from? There are many different thoughts on why the number seven is so popular for this. Some say it is because “On the seventh day God rested,” others say it aligns with the number seven in the bible, which is the most repeated number throughout the book. Because so many family traditions have developed throughout the years, there is no clear or absolute reason why the number is seven. Like I said, my family does thirteen, one for each Apostle and one for Jesus. The meal can be a combination of any types of fish you like. The most traditional are octopus, shrimp, clams, anchovies and Baccalà. 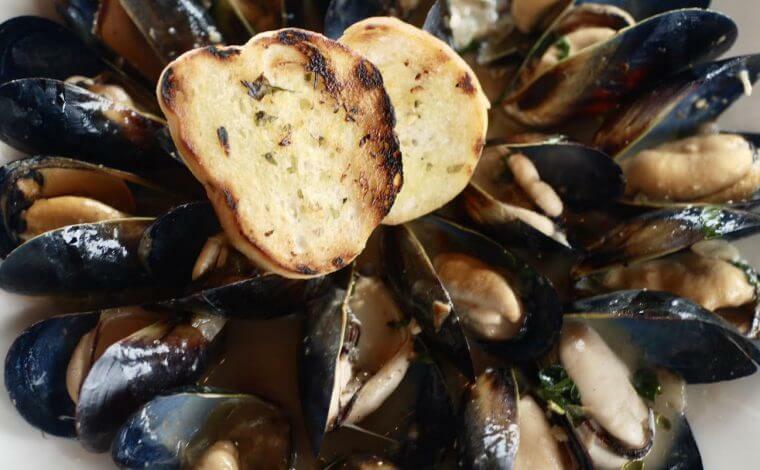 A great Zuppa di Pesce can satisfy most of the requirements by having calamari, shrimp, fish, mussels and clams in it. Other classics are baked clams or a chilled octopus salad. The key is to have one to represent each of the seven different fishes, but not every dish needs to be seafood. Much like any tradition, it is what you make of it. The Feast of the Seven Fishes is an incredible tradition for bringing families together. Opening clams, boiling octopus, and cutting calamari with family always guarantees a memorable experience. Some of my favorite holiday memories were made during The Feast of the Seven Fishes, partially because it’s not every day an eel will escape your grip and chase you and your cousins around the kitchen. Whatever your family’s traditions may be– no matter what you believe– I would definitely recommend adding a hearty fish stew or clam pasta to your Christmas Eve dinner! Who knows, you may end up starting your own tradition.